This steering wheel model gives a clear view of working mechanism of a steering wheel .It is designed for the demonstration to the students. This model is made out of full size original parts, suitably sectioned and to demonstrate the working of Steering wheel worms, Steering arm, etc. The Arrangement of Wheels And Axle Connecting To steering system will be done so the movement of the wheels when rotating the steering wheels can be displayed . The model will be mounted on to a tubular frame, Suitable color imported painting will be carried out along with Miracle coating for the model will be done for extra gloss and shine. The painting will be carried out in such a way that different colors will be use for different components such as identification of sectioned area etc according to the colors code for easy identification of different systems and mechanisms. All the hardware's and gears will be suitably electroplated. We are leading manufacturers, suppliers & exporters of Steering wheel set. 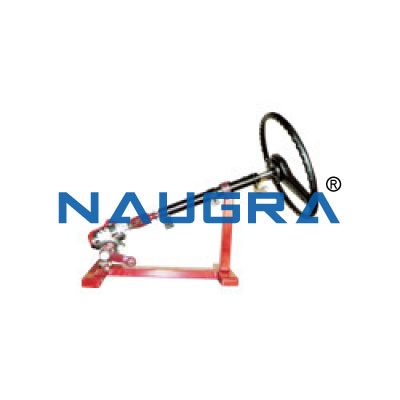 Contact us to get high quality designed Steering wheel set for schools, colleges, universities, research labs, laboratories and various industries. We accept bulk orders for government tenders in all countries around the globe.